(Texas Right to Life) In two Monday appearances on FoxNews, Judge Andrew Napolitano commented on Harris County D.A. Devon Anderson’s handling of the Planned Parenthood investigation. The investigation – which bizarrely took issue with the witnesses who uncovered Planned Parenthood’s criminal activity and not Planned Parenthood’s actions – culminated in a grand jury ruling indicting two journalists from the Center for Medical Progress. 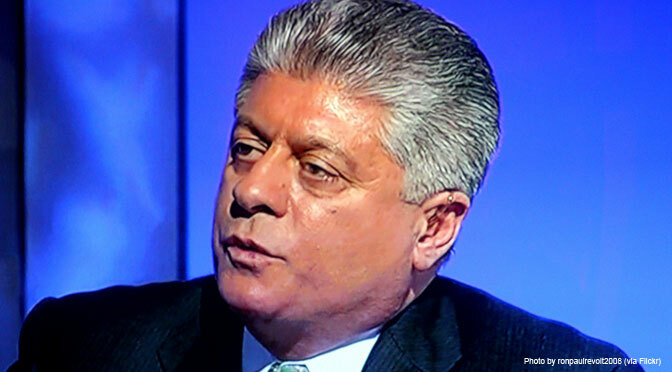 Napolitano called the outcome a “political hit job,” citing inconsistency in the charges. First, he explains, David Daleiden was charged with the misdemeanor of trying to buy baby body parts. Daleiden’s indictment reads: “[T]he Defendant… did then and there unlawfully, intentionally and knowingly offer to buy human organs, namely, fetal tissue, for valuable consideration.” Napolitano explains that this is a “crime of intent” – meaning Daleiden must have intended to actually purchase baby body parts for the felony to have been committed. Neither side has attempted to argue that this is true; in fact, Daleiden’s felony charge of creating a fake ID contradicts the idea that he actually intended to buy human organs because the false identity was assumed expressly for the purpose of exposing Planned Parenthood via undercover work. The charge related to purchasing trafficked organs is also problematic because, in order to charge Daleiden with attempting to buy fetal organs, scrutiny must be placed on the selling party, Planned Parenthood. The only way Planned Parenthood could have been exonerated from the tandem charge of intent to sell human organs would have been if the business had refused Daleiden’s request. In reality, the exact opposite occurred. Planned Parenthood was cooperative in every way with Daleiden’s propositions and explained their established scheme for carrying out such transactions without legal scrutiny. Indeed, Planned Parenthood’s research director, Melissa Farrell, delineated the protocol that had long been in place for accommodating the transactions of trafficking human organs out of their facility. She even explained how organ trafficking was worked into Planned Parenthood’s operational budget. Napolitano iterated that Harris County’s indictment of undercover journalists from the Center for Medical Progress was a political hit job. He also cautioned that the act of prosecuting a witness bringing crimes to light threatens to “chill” the investigative efforts of every journalist – and many government officials, who employ the same tactics in their quest for truth and justice. The audacious precedent set by Harris County in punishing the whistleblower and not the law-breaker is chilling indeed. Editor’s Note: Article originally printed at Texas Right to Life on January 29, 2016, and reprinted here with permission.